Believe it or not, there will be a new side-scrolling Mario game on the Nintendo 3DS. After hinting at it since the announcement of the Nintendo 3DS, Shigeru Miyamoto has confirmed that he's currently working on a new version of Super Mario Bros. for the 3D handheld. Try to act surprised. Miyamoto spoke of the game briefly in the latest installment of Iwata Asks, an ongoing roundtable interview series. While discussing Mario's future, he said that it was important for new Mario games to use the latest technology, but still hearken back to the fun of the original game. "So, in the interests of adopting new technology for the Super Mario Bros. tradition, I am now making a new Super Mario Bros. game for the Nintendo 3DS system," Miyamoto revealed. "I want to show everyone as soon as possible what the new Super Mario Bros. will be like on the Nintendo 3DS." 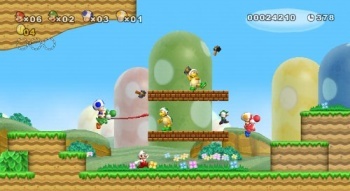 With the DS came New Super Mario Bros., which was later greatly expanded upon in New Super Mario Bros. Wii. Miyamoto always seems to have a trick up his sleeve for the Mario games, so I think we may want to expect something big considering the power and capabilities of the 3DS. The game could end up being Super New Super Mario Bros. 3D, which would be fine, but Miyamoto could also be creating an epic on the level of Super Mario World, which I don't think I'm crazy in saying is one of the best, if not the best Super Mario Bros. title ever. Miyamoto's hints about the upcoming game have mostly been talking about moving objects from the background into the foreground as Mario has to dodge them and the like. If anyone can figure out how combine a 3D visual effect with a 2D side-scroller in interesting ways, it's Miyamoto.